The Thermo Precision Compact Mechanical Convection Oven PR305225M provides fast drying, fast heat times and reliable use in a compact footprint. 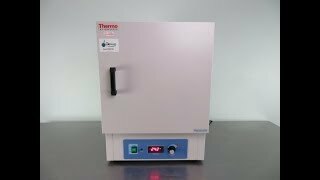 This benchtop incubator uses a mechanical convection for uniform heat and precise control. Mechanical convection is an ideal choice for fast drying thanks to the directed airflow in a horizontal pattern and hydraulic thermostat. The double wall interior is filled with 1” silica-based insulation helps retain temperatures, between 5° above ambient to 210°C, with a uniformity of ±7°C. The interior of this laboratory drying oven is aluminum, and the exterior is a corrosion resistant, powder coated cold rolled steel. This Thermo Precision Compact Mechanical Convection Oven PR305225M has been fully inspected and is ready to ship. All of our lab equipment comes backed with our standard warranty. Should you have any questions, please don't hesitate to contact us.